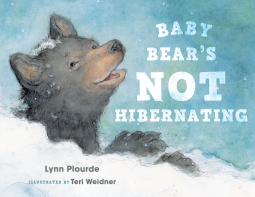 Baby Black Bear is planning to stay awake the who-o-o-o-o-le winter. To be prepared he asks his friends for smarts way to survive. How does owl stay awake all winter? What does moose eat when all the leaves are gone? How does hare keep himself warm? When the first snow comes Baby bear says goodbye to his parents and gets himself ready for the adventure. But the branch breaks when he tries to lie on it. And frozen twigs for dinner is not what he was expecting. He also is too big to fit in hare's burrow, nor he has the same thick fur for keeping him warm. Thankfully Papa bear is taking care of him from a safe distance. This is a cute bed time story. Any kid can relate with the fascinating idea of skipping sleep and staying awake the whole night, even it that means yawning endlessly. Baby bear is incredibly sweet. The beautiful illustrations make you want to touch the soft bear's fur, and to roll on the snow. At the end of the book there are a couple of pages with interesting facts about black bears to add some learning to the experience. We really enjoyed this book!